Nitrogen limits productivity in most of the ocean. To understand how nitrogen flows in a system is crucial in many aspects. Due to multiple micro-organism’s competing metabolism, nitrogen cycles rapidly through different pathways. In this talk, I will prepare you two cases of nitrogen dynamics. First one is about 15N labeling technique to detect nitrogen flows in an incubation bottle filled with oligotrophic seawater. Recent advances in 15N measurements allows us to examine multiple pathways of simultaneously-occurring nitrogen processes in oligotrophic ocean. Experimental results showed that community succession may happen in a bottle within 24 hours leading to biased rate measures. Proper estimators of rate of multiple nitrogen processes will be presented. The second case is about the application of nature abundance of 15N in a plume system under the influence of complex hydrodynamics. An endmember mixing model coupled with isotope mass conservation, nitrogen flows and associated biological processes were discerned. A conceptual diagram, which is wide applicable to estuary and plume systems, was constructed according to field observations. Oceanic mesoscale eddies with typical sizes of 30-200 km contain more than half of the kinetic energy of the ocean. With an average lifespan of several months, they are major contributors to the transport of heat, nutrients, plankton, dissolved oxygen and carbon in the ocean. Mesoscale eddies have been observed and studied over the past 50 years, nonetheless our understanding of the details of their structure remains incomplete due to lack of systematic high-resolution measurements. 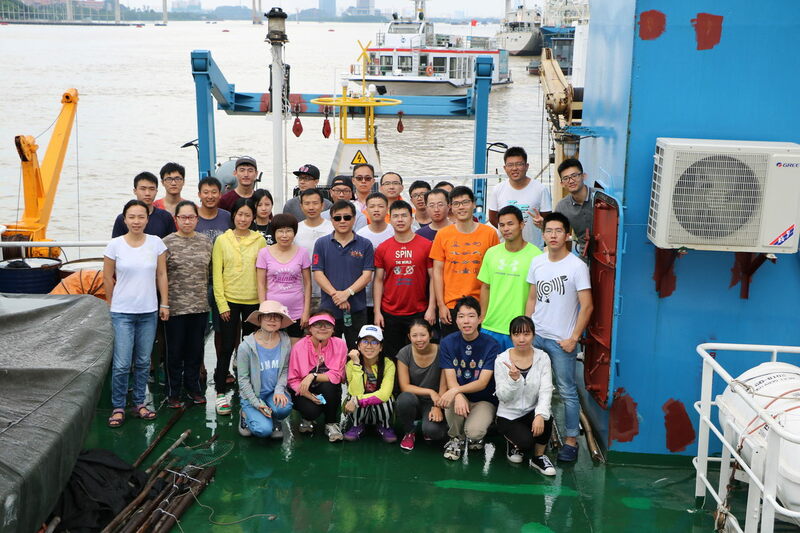 To bridge this gap, a survey of a mesoscale anticyclone was conducted in early 2014 in the South China Sea capturing its structure at submesoscale resolution. By modeling an anticyclone of comparable size and position at three horizontal resolutions the authors verify the resolution requirements for capturing the observed variability in dynamical quantities, and quantify the role of ageostrophic motions on the vertical transport associated with the anticyclone. Results indicate that different submesoscale processes contribute to the vertical transport depending on depth and distance from the eddy center, with frontogenesis playing a key role. Vertical transport by anticyclones cannot be reliably estimated by coarse-resolution or even mesoscale-resolving models, with important implications for global estimates of the eddy-driven vertical pumping of biophysical and chemical tracers. Recently, there has been considerable interest in examining how sea-level extremes due to storm surge may be related to climate change. Evidence of how storm-surge extremes have evolved since the start of the most recent warming of mid-1970s to early 1980s has not been firmly established however. Here we use 64 years (1950-2013) of observations and model simulations, and find evidence of a significant rise in the intensity as well as poleward-shifting of location of typhoon surges in the western North Pacific after 1980s. The rising and poleward-shifting trends are caused by the weakening of the steering flow in the tropics, which is related to climate warming, resulting in slower-moving and longer-lasting typhoons which had shifted northward. Global velocity data from drifters of the Surface Velocity Program and the sea surface height and geostrophic velocity data from satellite altimetry observations under tropical cyclones (TCs) were analyzed to demonstrate strong ocean currents and their characteristics under various storm intensities in the Northern Hemisphere (NH) and in the Southern Hemisphere (SH). Mean TC’s translation speed (Uh) is faster in the NH (~4.7 m s-1) than in the SH (~4.0 m s-1), owing to the fact that TCs are more intense in the NH than in the SH. The rightward (leftward) bias of ocean mixed-layer (OML) velocity occurs in the NH (SH). As a result of this slower Uh and thus a smaller Froude number in the SH, the flow patterns in the SH under the same intensity levels of TCs are more symmetric relative to the TC center and the OML velocities are stronger than those in the NH. Several special cases were reported in this study showing the occurrence of prominent cyclonic eddies with a life span of several months which were induced by slow-moving (Uh ~ 1 m s-1) and intense (category 3, 4, and 5 of the Saffir-Simpson Scale) TCs, either in the NH and SH. This study provides the first characterization of the near-surface OML velocity response to all recorded TCs in the SH from direct velocity measurements. Dr. Yan Bai is professor with the SOED Second Institute of Oceanography, with research interests in ocean carbon cycling and Oceanography, ocean optics and bio-optics Models. The talk focuses on the estimation of air-sea CO2 flux with satellite data. Recent progresses on the ocean carbon research from space will be introduced, with the special attention to the sea surface partial pressure of carbon dioxide ( pCO2), by using a mechanistic semi-analytic algorithm (MeSAA). Time series of satellite-derived air-sea CO2 flux in the China Sea and its variability are also presented. Prof. Delu Pan is academician of the Chinese Academy of Engineering ( Expert of Marine Remote Sensing ) with the SOED Second Institute of Oceanography of the SOA of the People Republic China, has devoted himself to the study of ocean color remote sensing and simulation science. As one of the founders of Chinese marine remote sensing, and plays a key role in the development of Chinese ocean color remote sensing and simulation science, and has made great contribution to atmospheric correction algorithms, ocean color reverse models development and application, as well as to the development of Chinese ocean color satellites and sensors in spacecraft. More than 110 papers have been published in domestic and foreign journals, or delivered at conferences. Copyright © 2010- 2019 The Ocean Dynamics and Modeling Program (ODMP) HKUST. All Rights Reserved.